The Republican Party of Michigan is signing on to a campaign to defeat candidates, including a Michigan Democrat, backed by J Street PAC, the prominent pro-Iran-deal, Mideast lobbying group. The Republican Party of Wisconsin announced its "stop J Street Campaign" in February, focused on defeating the congressional campaign of J Street PAC cofounder Dan Kohl for the House of Representatives. J Street is a D.C.-based organization that claims to be "pro-peace" and "pro-Israel" but which critics have described as "anti-Israel." The group has been censured for inviting individuals with anti-Israel views to their conferences. Notably, J Street was a prominent backer of President Barack Obama's Iran nuclear deal, pouring millions of dollars into support for the controversial agreement. The Israeli government has since called the deal a "historic mistake." J Street did not return a request for comment for this article. Now, the Michigan GOP is joining with its Wisconsin counterpart to hit J Street-backed candidate Elissa Slotkin, running for the House of Representatives in Michigan's eighth district. Slotkin is strongly backed by J Street, which solicits donations for her on its website. Slotkin's previous foreign policy work may have influenced J Street's decision to back her. Slotkin worked to build support for the Iran deal while at the Department of Defense, and has since publicly voiced her support for it. Slotkin's work history includes being blindsided by the rise of ISIS. Slotkin was involved in a closed-door briefing in 2014, the Free Beacon previously reported, in which DOD officials admitted that they did not foresee ISIS seizing as much power as it had. On her last day at DOD, Slotkin publicly butted heads with secretary of Defense Gen. James Mattis. She insisted the United States was doing enough to combat ISIS, while Mattis pushed ahead with the faster timeline that lead to brutal defeat for the terrorist group. In addition to J Street, Slotkin has been backed by Obama-era Iran deal authors and advocates Ben Rhodes and Samantha Power. Slotkin's campaign did not return a request for comment for this article. "The anti-Israel lobby and J Street are working with Nancy Pelosi and other extremists to knock off pro-Israel conservatives and replace them with candidates who support dangerous anti-Israel policies like the Iran Deal," said Michigan Republican Party Chairman Ron Weiser. 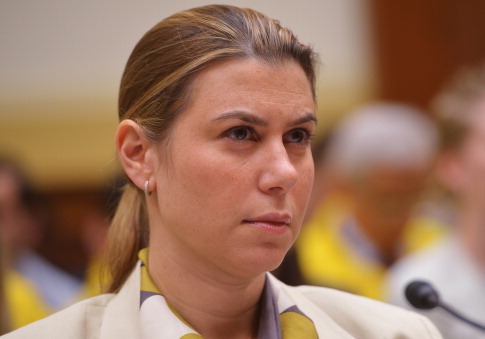 "Elissa Slotkin helped create the policies that created the Iran Deal and continuously underestimated the threat of ISIS. We must stop the radical agenda of J Street, Nancy Pelosi, and others who seek to place D.C. insiders like Elissa Slotkin in Congress to undermine the policies that keep this nation safe." Slotkin's Republican opponent, Rep. Mike Bishop, voted against the Iran deal, saying it "enables a belligerent state sponsor of terror to gain access to hundreds of billions of dollars and a path to nuclear weapons." Bishop has also been an outspoken supporter of Israel, including backing its attacks on Hamas in the summer of 2014. "A nation's first priority is to protect its citizens and Israel has the right to protect its citizens against this aggression. I call on President Obama to support Israel, condemn Hamas, and call for an end to Hamas's participation in the Palestinian Authority," Bishop said at the time. The "Stop J Street" campaign expects to give some $10,000 to Bishop's reelection campaign, as well as an additional $10,000 to the Michigan Republican Party. This entry was posted in Politics and tagged Israel, J Street, Michigan, Republican Party. Bookmark the permalink.